Know When Is The Best Time To Buy Your Next Big Buy! For many people, the process of buying a new car begins with the thinking that maybe it's time to change the drive or may be buy a first car. For some it's the decision they have to make because of mechanical problems, a car accident or some other event. If you have the luxury of timing your purchase, there are many ways to decide when it's the right time for your big purchase. 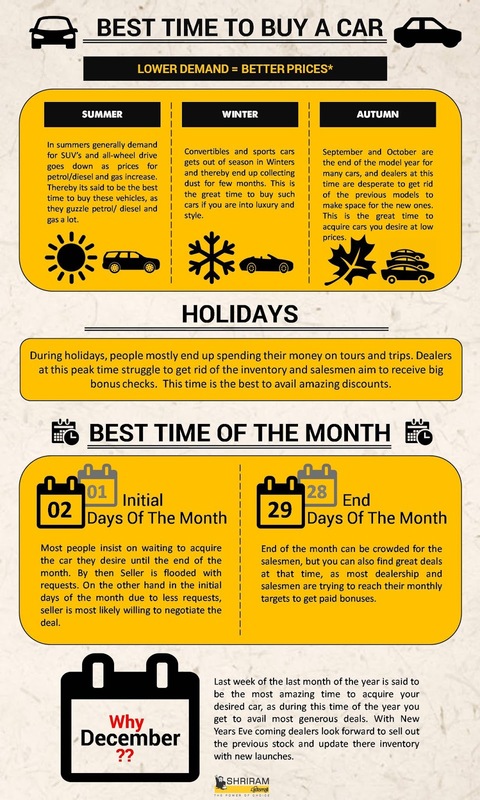 Thereby Shriram Automall India Limited (SAMIL) through this Info-graphic aim to make it easy for you to choose the best time to acquire a used car or new car without any hustle. Indian Automotive industry is one of the largest industries, which is considered as the significant contributor to country's economical development.If this year you are looking to acquire a car, we must tell you, acquiring the used one is the smart choice you can make. As by acquiring the used car, you can opt for the upper model of your desired make & brand at optimal prices. Shriram Automall India Limited (SAMIL) has never disappointed the used automotive industry and its customers. As the aim to be there for every used vehicle and equipment demand/requirement in the country has helped the company to keep it's most intensive inventory updated with all types of used automotives of every make and model.Company through its 100% subsidiary Adroit also offers services like valuation and inspection to help customers acquire the best used car as per their requirement. As per a used automotive industry report, used car market in India was 1.2 times the new car market in 2015-16. In the year 2017-18, an aggregate of 3.28 million passenger vehicles including hatchbacks, sedans and SUVs were sold in India. The used automotive industry saw the volume of 3.8 million units, according to industry estimates. SAMIL is your one stop trustworthy solution, which with transparent negotiable deals through different platforms will provide you the memorable customer experience. 26th Febraury’2011, a company with an aim to make India's most opaque and unorganized used vehicle and equipment market, organized and transparent came into existence. Company is best known for being India’s most trusted network provider with well structured bidding platforms for acquiring and disposing pre-owned passenger, commercial, two-wheeler, three-wheeler vehicles and farm, construction, industrial equipment etc. With grand FY 2017-18, company have successfully expanded, creating a strong market presence in the industry with total of 75 Automall Facilities and 150+ Bidding Locations across the Nation. From the very first step towards the National growth, SAMIL has been full of infinite possibilities and countless opportunities. But the success did not come its way on the very first day; rather there were stones in its path which company converted into several milestones to be celebrated. Till now company have been awarded with 21 Accolades & Recognitions for initiating innovative concepts and successfully organizing 50,000 bidding events, transacting 7,00,000+ used vehicles and equipment over the years with 7,50,000 Unique Bidders. Being the leader company have aim to serve as the No.1 used vehicle and equipment transaction platform to every individual in the country. As a part of one of company’s many endeavors, company also offers “MySAMIL Mobile Application” for its customers all over India, while aiming to provide its customers with an easily accessible advance solution which will help them to bid and go through company’s advance inventory form anywhere & everywhere. In the market full of highly occupied conservative and unreliable trade practices, SAMIL has successfully created a name for itself for offering completely transparent trade practices. Company is the OneStop solution for every used vehicle and equipment demand in the country. So, visit Shriram Automall today if you need to buy a used car/bike/commercial vehicle, equipment etc. of your choice at the most optimal price. You can also click the link below to simply register yourself. As compared to Electric Vehicles (Passenger Vehicles specifically), Electric buses are surging faster. 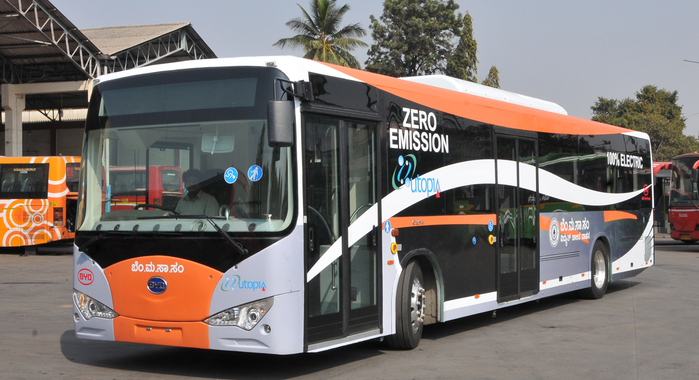 The electrification of road transport will move into top gear in the second half of the 2020s. This is fundamentally because of tumbling battery costs and bigger scale producing, with offers of electric cars dashing to 28%, and electric transports to 84%, in their particular worldwide markets by 2030. The progress of e-buses will be considerably quicker than for electric cars, as per a most recent long haul gauge from Bloomberg New Energy Finance (BNEF). It demonstrates electric transports in all charging arrangements will have a lower add up to cost of possession than ordinary city transports by 2019. There are as of now more than 300,000 e-buses out and about in China, and electric models are on track to overwhelm the worldwide market by the late-2020s. The BNEF demonstrates offers of electric vehicles (EVs) expanding from a record 1.1 million overall a year ago to 11 million out of 2025, and after that surging to 30 million of every 2030 as they set up cost advantage over interior ignition motor (ICE) autos. China will lead this progress, with deals representing very nearly 50% of the worldwide EV advertise in 2025 and 39% in 2030. The quantity of ICE vehicles sold every year (fuel or diesel) has begun declining in the mid-2020s, as EVs nibble hard into their market. In 2040, approximately 60 million EVs are anticipated to be sold, equal to 55% of the worldwide light-obligation vehicle showcase. Shared mobility cars will be a little however developing component. The pace of electrification in transport will change from country to country, especially in the following 12 years as few markets bounce in front of others. We hope this blog to be informative. For more such information, visit SAMIL at https://www.samil.in/, and till the new era vehicle kicks in, visit SAMIL's Automall facility to acquire the desired used vehicles and equipment compliant with latest emission norms. You can also register yourself by clicking the link below or by downloading company's very own mobile app. With a specific end goal to advance Biofuels in the Nation, a National Policy on Biofuels was made by Ministry of New and Renewable Energy amid the year 2009. Comprehensively, Biofuels have caught the attention in last decade and it is imperative to keep up with the pace of developments in the field. Biofuels in India are of vital significance as it go well with the continuous activities of the Government, for example, Make in India, Swachh Bharat Abhiyan, Skill Development and offers incredible chance to coordinate with the ambitious targets of multiplying Farmers Income, Import Reduction, Employment Generation, Waste to Wealth Creation. Policy on Biofuels was approved by the Cabinet on Wednesday. · Where presently, ethanol is essentially created from molasses, now sustenance grains can be utilized for delivering ethanol amid surplus production years. There is a degree for crude materials that can be utilized for delivering ethanol, including sugarcane juice, sugar beet, sweet sorghum, corn, and cassava, damaged food grains like wheat, broken rice, and ruined potatoes that are unfit for human utilization. · Food for fuel has regularly been a dubious arrangement matter over the globe, as numbers of people think utilizing grains for ethanol raises sustenance food inflation hazard. Farmers are at a danger of not getting suitable cost for their deliver amid the surplus creation stage. Considering, the Policy permits utilization of surplus food grains for creation of ethanol for mixing with oil with the endorsement of National Biofuel Coordination Committee. By restricting utilization of grains for fuel creation just in surplus production years, the legislature has attempted to restrain the hazard. India has for years trailed the official target of blending 5 percent ethanol and biodiesel in petrol and diesel respectively to cut pricey oil import and save foreign exchange. The current blending ratio is about 2% for petrol and less than 0.5% for diesel. · With a thrust on Advanced Biofuels, the Policy indicates a viability gap funding scheme for 2G ethanol Bio refineries of Rs.5000 crore in 6 years notwithstanding extra expense motivating forces and higher price tag when contrasted with 1G Biofuels. · The Policy empowers setting up of store network instruments for biodiesel generation from non-palatable oilseeds, Used Cooking Oil, short growth crops. · Concerned Ministry's/Department's role and commitments with respect to Biofuels have been gotten in the Policy to synergize tries. Biofuels program in India has been to a great extent affected due to the managed and quantum non-accessibility of residential feedstock for Biofuels generation which should be tended to. We hope this blog to be informative for you. As its time to switch your vehicle to Biofuels for the more economical approach. If you are an interested buyer or a seller of the used vehicle, feel free to opt for the amazing transaction platforms of ShriramAutomall India Limited (SAMIL) to buy any of the most demanded used passenger vehicles. You can both visit your nearby Automall or download “MySAMIL Mobile APP”, to get in contact with the professional team. You can also click the link below for easy and convenient registration & our team will contact you, to serve you. May'2018, Petroleum cost increased by 33 paisa a liter in Delhi - the most elevated since the day by day value update came into drive in mid-June 2017, and diesel by 26 paisa, as indicated by value notice issued by state-owned oil firms. Rates fluctuate from state to state contingent upon the frequency of neighborhood deals duty or VAT. Costs in Delhi are the least expensive in all metros and most state capitals. With this expansion, petroleum has touched an unequaled high, breaking the past high of Rs 76.06 touched in Delhi on September 14, 2013. Diesel rates are likewise at the unsurpassed abnormal state. This is the seventh straight day of cost increment since oil PSUs on May 14' 2018, continued every day value modification following a 19-day pre-Karnataka survey break. Taking all things together, petroleum cost has been raised by Rs 1.61 a liter and diesel by 1.64 in most recent one week. Petrol price in Delhi have touched a record high of Rs 76.24 for every liter and diesel moved to its most elevated ever level of Rs 67.57 as the oil PSUs passed on a month of relentless rise in international oil prices to consumers. In India, petrol is the costliest in Mumbai where high local taxes have driven a cost of Rs 84.07 for each liter. Oil has broken Rs 80 stamp in Bhopal (Rs 81.83 a liter), Patna (Rs 81.73), Hyderabad (Rs 80.76) and Srinagar (Rs 80.35), as per the value notice. Petroleum in Kolkata costs Rs 78.91 for each liter while it is estimated at Rs 79.13 in Chennai. The least expensive petrol is accessible in Panjim where a liter costs Rs 70.26. 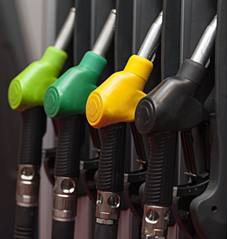 A liter of diesel costs Rs 71.94 in Mumbai, Rs 70.12 in Kolkata and Rs 71.32 in Chennai. Diesel is the least expensive in Port Blair where it is valued at Rs 63.35. And at the same time to acquire or dispose used vehicles & equipment take benefit of Shriram Automall’s esteem lineup, as they offer best quality assets at optimal prices through multiple bidding platforms. 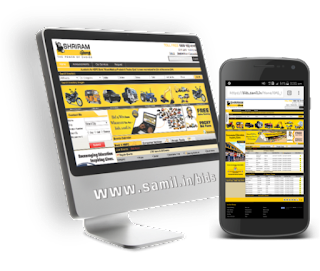 You can both download “MySAMIL Mobile App” and register yourself on the following link and go through the vast inventory filled with used vehicles & equipment of every make & brand. The financial year 2017-2018 was an exciting one for the automotive industry in India. From the implementation of the Goods and Services Tax (GST) administration and the nation's progress to the BS IV emission standards, there were numerous new recommendations that changed the beat of sales in the area. The introduction of new passenger cars from luxury brands in the Indian automotive space was a highlight as well. The administration's goal to change over to an all-electric armada by the year 2030 likewise got a push a year ago. With FY2017-18 getting finished on March'2018, passenger vehicle (PV) segment especially drove into the fast lane, with sales nearing the 3.3 million mark and concluding FY2018 with 3,287,965 units (FY2017: 3,047,582 / +7.89%). This robust growth was primarily fuelled by UVs, which cumulatively sold 921,780 units in FY2018, registering solid 20.97 percent growth (FY2017: 761,998), while passenger cars, on the other hand, brought a sizeable chunk (66%) of the volumes at 2,173,950 units but grew at a comparatively slower 3.30 percent (FY2017: 2,103,847). So, let's take a drive down a memory lane and analyze all the models of cars and SUVs that raked in the profits in May 2018. The total number of units Alto sold were 2, 57,732 in the calendar year 2017. The month of June 2017 saw the least number of vehicles sold, but the YOY growth recorded for the model was 13%. The Dzire sold a whopping 30,934 units in the first two months of its introduction. The total number of units sold last year was 2, 25,043, with an average sales figure of 18,754 units. The Baleno recorded a sales growth of 81%, selling a total of 1, 77,209 units last year. This is an average of 14,767 units each month. The Swift sold 1, 67,371 units of the car last year, which is effectively an average of 13,948 units per month. The WagonR was chosen by 1, 66,815 car buyers in the calendar year 2017. The car also hit a landmark 2 million unit sales figure in the month of September 2017. The Hyundai Grand i10 was the top-selling car from the car manufacturer in the year 2017-18. The company sold 1, 54,787 units of the hatchback in the calendar year 2017, averaging 12,900 units per month. The Maruti Vitara Brezza,sold more than 1,40,945 units in 2017. The average monthly sales observed for the vehicle was 11,745 units. It also offers the highest mileage among all crossovers in the country. The Elite i20 is the second best-seller from the Hyundai fleet. The car manufacturer observed sales of 1, 34,103 units of the hatchback in 2017, and averaging 11,175 units each month. Among the crossovers that recorded smashing sales in 2017-18, the Hyundai Creta stands at second position. It sold 1, 05,484 units the last calendar year, with an average of 8,790 units each month. Last year, the Maruti Celerio sold 1, 00,860 units, averaging 8,405 units each month. The car outsold the Swift in October 2017, but finished the year at the 10th position. 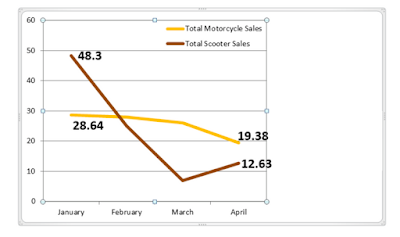 Motorcycles or Bikes sales in India have ascended at a substantially quicker clasp than scooter sales for the third back to back month, demonstrating recuperation in the nation's rustic markets after the twin disturbances of demonetization and the execution of the merchandise and ventures charge (GST). India is the world's biggest bike showcase as far as deals. Among sales goes, development was driven by the section level portion (engine limit in the vicinity of 75cc and 110cc) and the worker fragment (engine limit in the vicinity of 110cc and 125cc), the backbone of the rustic markets, where clients lean toward nitty gritty bikes to gearless scooters in urban India. The two portions have either outpaced or leveled with the more extensive bike section since November 2017, when bike deals development returned the dark. Higher farm incomes, led by higher minimum support prices (MSPs) announced for the kharif crop, in addition to better road connectivity, loan waivers announced by various state governments and the 7th Pay Commission will support demand for two-wheelers from rural areas. However, analysts also expect scooters to grow at a faster pace on the back of rising rural penetration, among other factors. 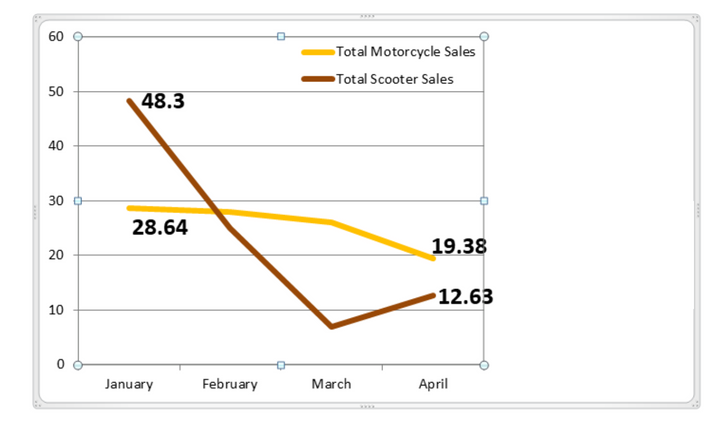 It is expected scooters will grow by 14-16%, followed by motorcycles and mopeds at 8-10% and 6-8%, respectively. 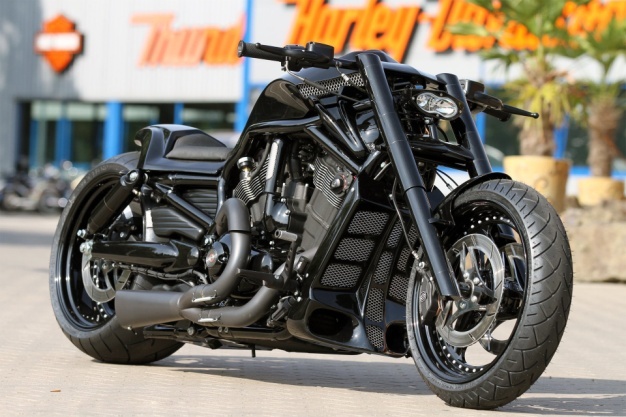 With every new two-wheeler model sold, used automotive industry can see the growth as well. 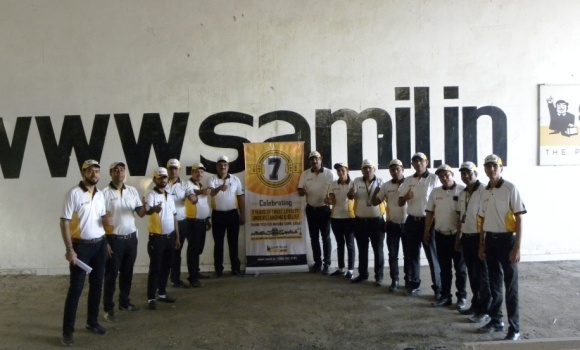 Shriram Automall India Limited (SAMIL), The Largest Platform for Acquisition & Disposal of Pre-owned Vehicles & Equipment in India, has successfully unfurled its 75 Automalls across the country, for customer convenience. So whether urban or rural, if you are interested in buying or selling used two-wheelers visit your nearby Automall soon. Nowadays searching used construction equipment is very helpful on the web. There are such a large number of choices accessible in the domain of World Wide Web, that settling on a decision gets completely simple. Presently days, offering have turned out to be very noticeable among the majority and credit goes to Shriram Automall India Limited (SAMIL). The main name from giving most composed bidding platforms for acquisition and disposal of used vehicles and equipment of any make and model. Out of different imaginative platforms, online bidding based events has made the trading of used construction equipment energizing and advantageous to a great degree. Along these lines, we should look at some bidding tips that will enable you to get value for your money while acquiring the used equipment of your choice and need. • Before you bid on the used construction equipment, know its incentive ahead of time. A legitimate research on the hardware required will causes you to cite the most fitting sum on the equipment. • Also keep in mind to peruse the terms and states of the dealer appropriately. Along these lines, you would be spared from any issues in future. Visit bids.samil.in for your next used construction equipment, as SAMIL presents a wide assortment of used construction equipment through its online bidding events, aside from commercial vehicles, tractors, cars and SUVs, 3 wheelers and 2 wheelers of each make and model, SAMIL also deal in gold and property. Company likewise has a portable application through which you can experience their inventory whenever convenient from anyplace. So what are you waiting for? Tap the link underneath to enroll yourself. The Central Board of Excise and Customs (CBEC), in February this year, had cut the duty on bikes of 800cc or less and above 800cc to 50%. Earlier, the duty on motorcycles with engine capacity of 800cc or less attracted 60 per cent duty, while those above 800cc had 75. Three months after Indian government diminished the import obligation on extravagance cruisers; the industry has seen a significant spike popular, with positive signs, particularly for the players who import completely built units (CBUs). The deals have gone up by 40% since decrease of import duty in February. With the usage of diminished import duty, the cost of luxury motorcycles has descended by over Rs 2lakh per unit, which has resulted in the deals bounce. Be that as it may, on the other side, while the obligation slice prompted increment after of imported superbikes, the ones privately amassed saw tax increment of 5.75% in the Budget. 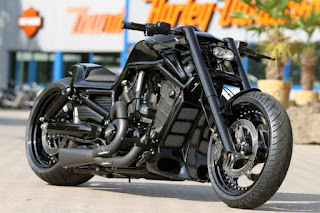 The CBEC has expanded the traditions obligation from 10% to more than 15% on import of engine, gear box and transmission mechanism as a completely knocked down (CKU) kit, which the bike makers termed as anti-Make in India move. While the number in dispatch post duty cut have gone up, the bookings of these bikes have also increased as also the number of visiting customers in the showrooms. Shriram AutomallIndia Limited (SAMIL) being the leading name in the industry is the only platform providing Physical Bidding Platform to buy and sell used cars, bikes, commercial vehicles, agricultural / construction equipment, three-wheelers etc. To acquire used motorcycles or any other automotive of desirable make and model at optimal prices, visit your nearby Automall. The administration likewise plans to permit youth in the age section of 16-18 years to drive electric bikes, other than commanding taxi aggregators to have a specific level of e-vehicle armada. The legislature has endorsed particular green tags for electric vehicles to urge individuals to utilize electric vehicles. Such vehicles will be fitted with green tags bearing numbers in white textual styles for private autos and yellow textual style for taxis. The reason behind particular number plates is their simple recognizable proof for special treatment in parking, free section in congested zones other than other proposed benefits like concessional toll. Similarly, all public transport operators may also be mandated to provide 1 per cent incremental fleet from 2020 onwards. Government is tightening fuel efficiency norms to strengthen that electric vehicles will bring down vehicular pollution. 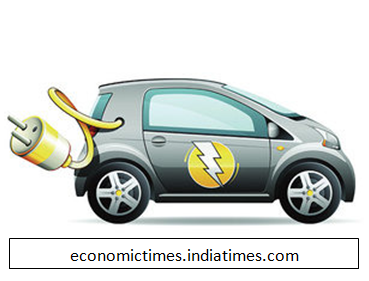 Besides, Ministry of Road Transport and Highways will request the finance ministry that the rate of depreciation on EVs may be allowed at 50 per cent as against the rate of 15 per cent for conventional vehicles. The proposals include bringing down the GST on batteries to 12 per cent at par with the GST on EVs. As per an estimate, India at present has 1 to 1.5 lakh electric vehicles and it is projected to grow to about 5 per cent of the total vehicles in the next five years. All these initiatives are being implemented to improve the quality of air, in the country and to make Automotive Industry more economical and safe. So, Wait for it and till then if you are looking forward to buy or sell used equipment or vehicles compliant with latest government emission norms, SHRIRAMAUTOMALL is the best place to come to. Visit nearest Automall to you or download “MY SAMIL APP” to go through their latest inventory filled with used vehicles of every make & model. You can also click the link below to simply register yourself. 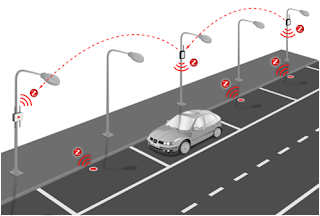 With Smart Roads, You Will Be Able To Book Your Parking Lot! Under the smart city project of the union government, New Delhi Municipal Council (NDMC) will soon develop roads as ‘smart roads’. NDMC has chosen three streets to develop first - Mother Teresa Crescent Street, Janpath Road and Sansad Marg. The idea of smart roads is to give better facilities on a specific extend like outdoors cafeteria, arranging, road furniture, and so forth. The task will likewise observe supplanting road lights with LED lights, with the savvy posts having Wi-Fi office. The smart roads will have sensor-based smart parking system as well. People can book the slot using NDMC 311 mobile app at any desired location in advance and pay through e-wallet or internet banking. NDMC has procured 60 smart poles, which will have facilities like Wi-Fi, CCTV camera, environment sensors and warm LED. Along with smart poles, these roads will have digital interactive information panels. People can use this panel for registering any complaints with NDMC and also can avail services online. These roads will also have special features like landscaping, vertical gardens, cycle tracks, street furniture, plazas/eateries, pelican crossing and 3D zebra crossings. The ovrall concept of smart roads is to provide better facilities on a particular stretch like open-air cafeteria, smart toilets etc. The project will also aim at replacing street lights with LED lights, with the smart poles having Wi-Fi facility. For Acquisition and Disposal of used vehicles and equipment, Shriram Automall India Limited (SAMIL) is the leading name in the country.